F & F Farms is the farming operation owned by Lance and Drew Frederick. There are nearly 10,000 acres of cropland with an additional 3,500 acres of grass. 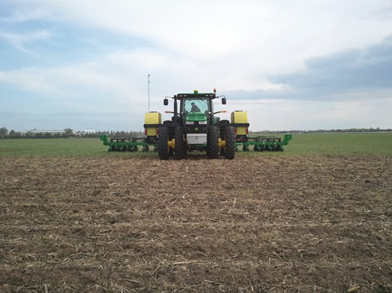 F&F Farms grows Wheat, Corn, Soybeans and Milo (Sorghum). In addition to cropping they maintain a herd of 250 cows. Center pivot irrigation systems irrigate 2,000 acres which are primarily corn and soybeans but are also used to water rye for cattle feed after the corn is harvested. F&F Farms also custom farms about 10,000 acres, all with the latest and most progressive techniques. 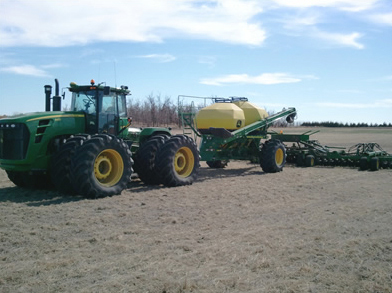 We use John Deere tractors and seeding equipment as well as a 4045 sprayer. Our yield mapping, crop planting and spray application is monitored and controlled through John Deere's GreenStar 3 precision farming system. F & F Farms operates 2,000 acres of irrigated land consisting of 19 center pivots. Center pivot irrigation is a form of overhead irrigation consisting of several segments of pipe joined together and supported by trusses, mounted on wheeled towers with sprinklers positioned along its length. The system moves in a circular pattern and is fed with water from the pivot point at the center of the arc. F & F Farms operates a John Deere 4045 sprayer, equipped with GreenStar 3 and AutoTrac. A spray trailer was specifically designed by F&F Farms to provide transport for the sprayer along with the ability to haul 4000 gallons of product. This combination allows us to efficiently spray fields and better manage distance time.